Daniel Ledesma, 23, from Arizona, born in Argentina. 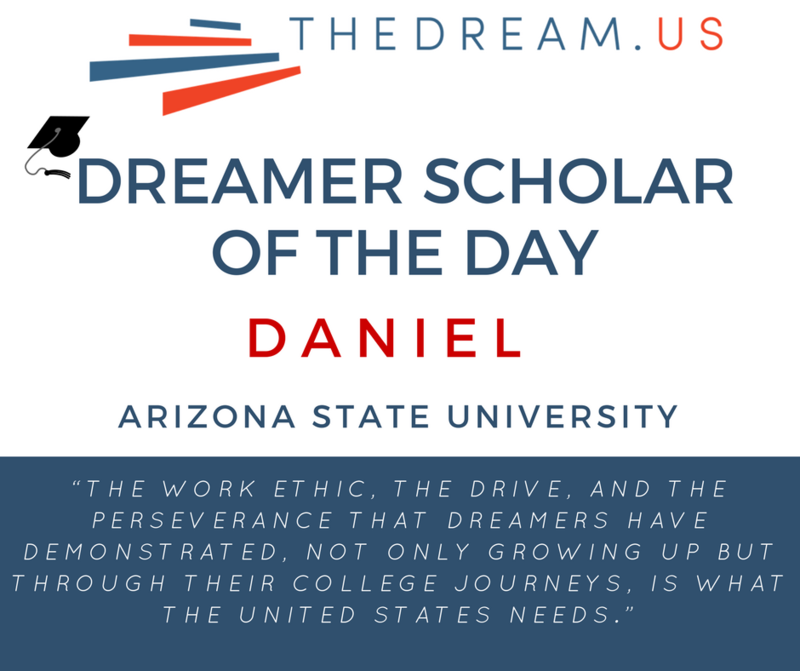 The work ethic, the drive, and the perseverance that DREAMers have demonstrated, not only growing up but through their college journeys, is what the United States needs. People willing to make a difference not only in their lives but others’ as well, those are the people that can help society. What better way to get these people into the workforce and fully contributing than by providing them with a college education, and the resources they need to succeed? When I was six years old, my dad left for America, with a promise to come home soon. A year later, I left Argentina to join him. I can remember clearly our adventure to the embassy in Argentina and getting my passport, taking a bus to Cordoba, and boarding a plane to the U.S. I’ll never forget landing in Los Angeles, CA, and seeing my dad for the first time since he left. I found out about my legal status, and its significance, after a year of living in the United States. My dad lost his job at a power plant, because he was undocumented. I asked him what that meant for our family. He told me that it would make things pretty difficult for us but that we couldn’t give up. I grew up in Arizona, and for many years had a hard time fitting in at school. My father was in and out of work. When he was out of work, we struggled to put food on the table. When he was employed, I was responsible for taking care of my younger brothers. My status was always lurking in the back of my mind, separating me from my peers and their lightheartedness. We moved back and forth between Arizona and Utah, finding housing in basements and renting rooms. Many nights, I slept in a sleeping bag, which was difficult when winter came. Life got a bit easier once when I received DACA in 2013. The opportunities that it afforded me opened my eyes to all that I can accomplish in and contribute to America. I went to Glendale Community College for three years, and I paid for my tuition out of pocket. I then received TheDream.US scholarship and was able to transfer to Arizona State University, my dream school. I am currently 23, studying chemistry, and plan to pursue my PhD. I want to ensure my future family has an easier life than I did, and I want to pay back everything my wife has sacrificed for me to continue my education. I ultimately want to teach chemistry either at a community college or university. To my fellow DREAMers I would say: Don’t give up, things will get hard, and there are going to be times where you feel scared and hopeless. That’s normal, I’ve been there. But it is important that you pick up your head, think about your family, think about those you want to make proud, and think about yourself and where you want to be. Use that as fuel and fight. Fight for everything you need to make a difference in your life, and don’t give up. It is easier to give up sometimes, but as a Dreamer our perseverance is what sets us apart from the rest. When things get difficult we don’t give up, we stand up and push through and persevere.